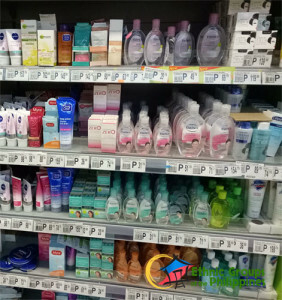 Different whitening products displayed at a local grocery store. Quezon City – Many Asian countries have been obsessed with white skin as such is considered to be synonymous to beauty and prosperity. In the Philippines, many Filipinos would spare a hefty chunk of their wages to splurge on whitening products, such as lotions, soaps, creams, or even oral capsules. Four out of ten women in the Philippines use skin whitening brands, along with other Asian countries like South Korea, Malaysia, and Hong Kong. As the youth population continues to grow in the country, an increase in the demand of such beauty products is projected to surge in the next few years. We spoke to Jade, a teenager, who stated that she thinks she looks plain for having morena or tanned skin compared to her friends. She added that girls her age with whiter complexions get more compliments compared to girls with darker skin. Another user of skin-lightening supplements named Kate also remarked that “it’s always a plus if you are fair because it gives you countless advantages.” This situation, although alarming, has been the norm for Filipinos, who have always admired those with milky white skin. The Philippines has a long history of colonial occupation; first by Spain, and then by the United States. This history has influenced our culture’s standard of beauty. Our three hundred years under Spanish rule, for example, exposed us to the idea of skin color hierarchy. For instance, a mestizo, or a Filipino that has foreign ancestry, is considered to be superior to pure Filipinos based on the mestizos’ fairer complexions. This mentality has persisted until modern times. Nowadays, lighter skin is perceived as the complexion of the rich because of the assumption that they stay indoors in air-conditioned rooms, whereas darker skin suggests that one belongs to the working class exposed to the scorching heat of the sun just to make ends meet. Most billboards in Metro Manila’s major freeways are brimming with fair-skinned models. Local celebrities that are mixed race or have foreign blood seem to be more prevalent than pure-blooded Filipinos, as the former have light complexions and a more international look compared to the latter. In addition, almost all TV commercials for beauty products constantly promote fairer skin and that white is more beautiful. As a result, being pale has become the standard of beauty. Rachel, a primary teacher in a local school, has awful memories of her childhood because of her brown skin. “Growing up, I was always compared to my younger siblings who had lighter skins that they inherited from my mother’s side of the family. I remember questioning my father a few times if I was beautiful like my younger siblings were, as I would often hear other family members complimenting their appearances more than mine. As a child, it can really get to you. After a while, you start doubting yourself.” She added that once she got a job and was able to afford her own things, she invested in whitening products to enhance her looks, which made her feel more confident as a woman. Despite the risks and harmful ingredients of whitening products, such as mercury and hydroquinone that pose serious health risks when used for prolonged periods, the Asia-Pacific region is found to be the fastest growing market for skin-lightening agents in the world, with the Philippines being one of the top six countries that offer tons of whitening lotions, creams, pills, and injectables. Surprisingly, consumption of such products are not attributed to women alone but to men as well. More than 25% of young male university students in the Philippines use skin whitening products, according to a study done in 2015. Last year, the male cosmetics industry was valued at $2.1 billion, with whiteners making up a large percentage of this figure. Skin lightening has long been a trend in Asia for many centuries and is predicted to persist. Marigold, a local hospital nurse, said the reason she uses a whitening soap is to simply feel beautiful and feel good about herself. Furthermore, she said that she likes all her Asian features except her skin, which she wishes were much lighter. Although recent awareness campaigns in some Asian countries have encouraged women to embrace their natural skin tone, it might take a while for the Philippines to break free from this fad. So expect to spot these skin-lightening products in pharmacies, beauty stores, shopping malls, and supermarkets.